In this beautiful, elegant necklace are cool pink step-cut Kunzite and lively faceted pink topaz rondelles, lemon step-cut Kunzite and warm pinks of rose quartz, tourmaline natural crystals and faceted ‘pink’ agates. 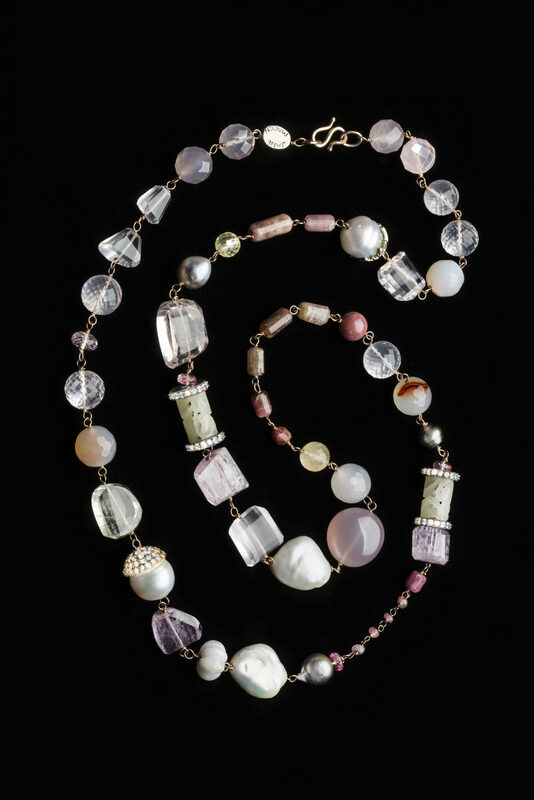 Two carved white jade cylinders, two white South Sea pearls, with aquamarines or moonstones in silver caps, three silver Tahitian pearls and two large freshwater baroque pearls, two lemon kunzite, a lemon quartz and two large freshwater baroque pearls are hand worked onto 18 carat rose gold wire. This necklace is inspired by Jane Magon’s memories and direct experiences with the land in the Australian outback and the coming of dawn in pale pinks and gold caressing the pale yellow tufts of spinifex and textured rock. Her ‘landscape’ necklaces are often ‘painted’ in gems and gold or silver. 1 x 10.57 mm gold rutilated Quartz.